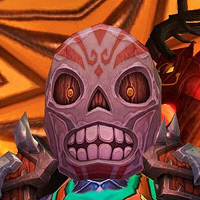 Day of the Dead is the in-game counterpart of the Mexican Day of the Dead celebration. Lasting only 3 days, this event is very short and rewards players that participate with an achievement, Dead Man's Party, as well as with a pet, Macabre Marionette, and a temporary mask, Whimsical Skull Mask, both of which being only usable during the event. In 2014, new achievements were added and they consist in wearing costumes sold by Chapman and defeat other costume-wearing players in combat. You will find explanations in our Costume Combat section. 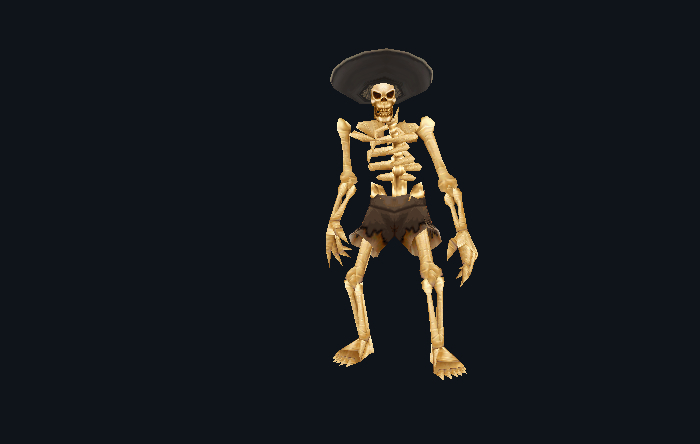 The main attraction of the event is the Dead Man's Party achievement, which is obtained by dancing (/dance) with Catrina, an NPC named after La Calavera Catrina. She then turns you into a skeleton. Stormwind: in the cemetery behind the cathedral (at coordinates 47,26). Undercity: in the Ruins of Lordaeron (at coordinates 68,11), right after the entrance. Dalaran: inside the city (at coordinates 34,38), on the grass patch, right of the stairs to the Violet Citadel. Shattrath: in Terokkar Forest (at coordinates 40,22), just east of the city. Make sure to choose a Neutral graveyard or the graveyard of your race's home city, as the rest of the event can only be done there. Worgens need to go to Darnassus and Goblins need to go to Orgrimmar. For Pandarens, it looks as if only a Neutral graveyard will work. Whimsical Skull Mask is a mask that can be bought from Chapman and that can only be worn during the event. Macabre Marionette is a pet that you can obtain by following the steps described below. Acquire Recipe: Bread of the Dead from Chapman, who stands next to Catrina. Learn the recipe (it counts towards the Iron Chef achievement). Make a Bread of the Dead. Purchase a Bouquet of Orange Marigolds or a Orange Marigold from Chapman. Use whichever of the two items you bought so that you can see the Cheerful Spirit and accept his The Grateful Dead quest. Complete the quest by giving your piece of Bread of the Dead to the spirit (this counts towards the 3000 Quests Completed achievement). Receive your Macabre Marionette pet. Important note: it seems that this quest can only be done in your race's home city. For example, Night Elves can only do the quests in Darnassus. When you use one of these costumes, it applies a buff on you that reduces healing taken by 100% and allows other costume-wearing players to attack you (and vice-versa). Players wearing costumes can only attack each other using the 3 special abilities that wearing a costume gives them. These special abilities can be cast using an extra action bar button, but there is only one button and the ability you can cast changes every time you use the button. Jump Attack, which has a 1-second cast time and causes you to jump forward towards your enemies, dealing damage equivalent to 30% of their health to other players and knocking them down for 3 seconds. Calavera, after defeating 50 players. 01 Nov. 2017: Fixed Whimsical Skull Mask image. 01 Nov. 2014: Added new 2014 achievements. 01 Nov. 2013: Macabre Marionette is now a proper pet (was a temporary pet before).